As I sit here and think about my next blog post topic I break out into a sweat just wondering about everything that can be put into this text box. It then hit me, I spent more time in the past 10 minutes focuses on how hot the room I am in then actually doing the work. This sparked at great idea! What is the effect temperature has on studying or any academic performance for that matter? 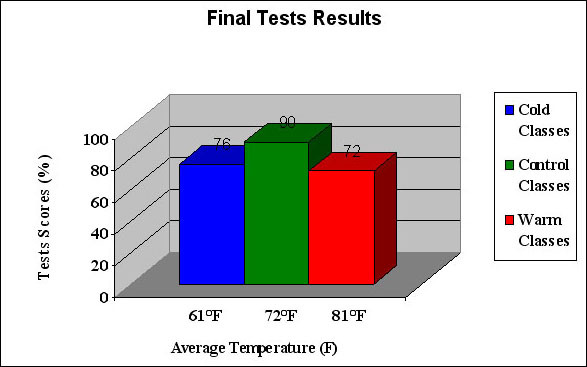 A study was done on temperature effect on academic performance at Westview High School in Portland, Oregon. The researchers conducted aptitude tests on 9th graders in classrooms with varying temperatures and analyzed the results. These tests included memorization between shapes and colors and basic math equations. A great part about this study is that it lays out the control variability to strengthen the results and accuracy of the study. Here were some of the key points. “The groups tested were the same age, so they would have the same opportunity to take the test. Six different classes were tested, so students didn’t have any prior knowledge about the content of the test. This study was going strong until the results of the first test came out. There were a couple issues that the team noticed. First, the temperatures were not varying enough making it inefficient to tell whether there was much of a n effect or not. A large obstacle facing the team was the test it self. it was a very simple test not really testing the attention span or academic performance of the students as well as a hard test wold of conducted. The team went back to drawing board and increased the temperature differences and strengthen the test to increase the effort the students needed to produce to complete the test. 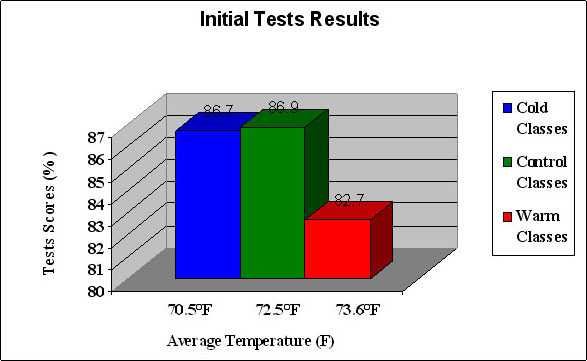 The second test was greatly different and you can actually see the effect of temperature on performance. When the students were exposed to drastic temperatures of being cold or hot their performance ranged in the 70s. But in the control group we can see an average of 90. This is significant data to show that temperature does correlate with student performance. But with all studies we can find some negatives of the study. To begin this is merely correlational and many factors can contribute to the bulk of these scores. This can range from different light in the different rooms, the test administrators, other students in the class could of distracted one another. There are plenty of cofounding variables but this does show great results on temperature effect and it is highly unlikely that any of the cofounding variables would bring out these results. Another issue I came across the study is that it has potential to tell us more information. The data isn’t strong enough to exactly tell the amount of effect that temperature variation has on performance. However a second study caught my attention, but this time it was to find the temperature that creates the bets performance. In this meta-analysis study Helsinki University of Technology, Laboratory for Heating Ventilating and Air-conditioning has “focused on the effects of temperature on performance at office work.” The performance variable used to calculate work efficiency was text processing, simple calculations (addition, multiplication), length of telephone customer service time, and total handling time per customer for call-center workers. The team calculated from all studies the percentage of performance change per degree increase in temperature and analyzed measured work performance with temperature. Within this study we are not only branching out of the objective of the study but also out of the classroom and into a work environment. Here are the studies that were calculated into the meta-analysis. The results show that performance increases with temperature up to 21-22 degrees and decreases with temperature above 23-24 degrees. The highest productivity is at temperature of around 22 degrees. Findings such as these can help businesses redirect their work in a more efficient and helpful way. Comparing these two studies we have learned a couple of things. We learned that increasingly tho and increasingly cold temperatures negatively effects performance but with the meta-analysis we have strict data to confirm that within the control group that performed the best in the first study we can assume maximized performance peaked when the room was around 22 degrees. This entry was posted in Uncategorized on December 2, 2015 by Dean Giammarco. I am surprised about this topic because I did not realize temperature will also influence our academic performances. In your blog, you analysis the key points of the study and point out that this study considered the third variables and ruled out reverse causation. But whether the study is large or not seems not mentioned in your blog. I also feel really curious that why temperature influence the academic performance. Is it influence their concentration? You seems not talked about the reason in this blog. (Oops i posted too soon before!) This is a very important topic! Room temperature is something Penn State has yet to adequately accommodate. I’m always so hot in my classes which I’ve noticed makes it very difficult to focus in class. I found this article, https://www.screenflex.com/do-classroom-temperatures-affect-students-ability-to-learn/, which talks about Loyola University’s study. This study also confirms that the “perfect temperature” is about 72 degrees Fahrenheit. (I do think you should stick to all either Fahrenheit or Celsius. Mixing them is a bit confusing.) This article also says that the study was done using memory tests. I think it would be interesting to see a study that goes away from the memory tests and tests on english or writing. Another idea would be to have a mass study done across multiple different schools, grades, ethnicities, etc. and uses a test containing different sections with memory, language, math, etc. It would interest me to see how scores vary based off of location on Earth. Students closer to the equator might do better in a room that is 80 degrees Fahrenheit versus students far away from the equator might do better in a room that is 65 degrees Fahrenheit. (I’m making guesses about the exact temperature but you get the point.) Then, I think it is very important to actually use this information. The study should be sent to schools and universities so that the correct authorities can actually implement a good learning temperature into classrooms. Cool topic! Nice post! The only thing I would consider changing is the fact that you use Fahrenheit throughout the post until the final paragraph where you use Celsius. The post was very informative, and I happen to agree. I am never able to do work in a room that is too hot, I always find myself falling asleep. If a room is too cold, though, I actually find myself to be more productive. Maybe it has something to do with having a sense of urgency to finish my work and get out of there! Either way, I think there is sufficient evidence to say that a hot room is the least productive for students.